Correct under eye darkening and visible bagging with this effective blend of ingredients to help reduce the appearance of darkening and tighten loose skin in the sensitive area under the eyes. Excessive under eye darkening and visible bagging prematurely ages eyes. Correct it with this effective blend of ingredients to reduce the appearance of darkening and tighten loose skin in the sensitive area under the eyes. You'll be a bright-eyed beauty in no time. 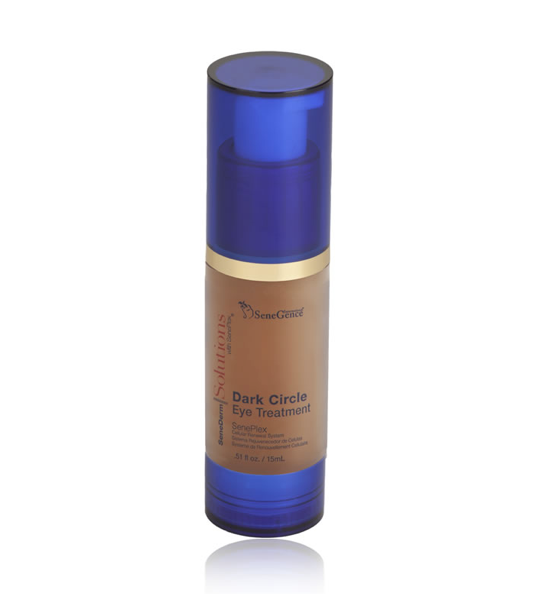 Dark Circle Eye Treatment helps reduce Dark Circles by 122%! Tests also reveal a significant reduction of edema (swelling caused by fluid often creating under eye puffiness). The combination of ingredients Pfaffia Paniculata (Suma) Root Extract and Ptychopentalum Olaciodes (Muira Puama) Bark/Stem Extract along with Lilium Candidum (Lilly) Flower Extract, creates the most complete and scientifically based dermocosmetic treatment of imperfections, especially dark circles, edema and under eye puffiness. Apply to cleansed, dark and or bagged skin areas under eyes both day and night. Follow with SeneDerm®SkinCare moisturizing regimen. Caffeine - an antioxidant most shown to repair damage and slow the aging process. Saccharomyces Cerevisiae Extract - a skin-conditioning agent used in cosmetics and beauty care products because of its ability to improve skin conditions. Punica Granatum (Pomegranate) Extract - a super-anti-oxidant with astringent and anti-bacterial and inflammatory properties. Camellia Sinensis (Green Tea) Extract - Protects collagen from being broken down. Apply to cleansed dark and or bagged skin areas under eyes both day and night. Follow with SeneDerm® SkinCare moisturizing regimen.